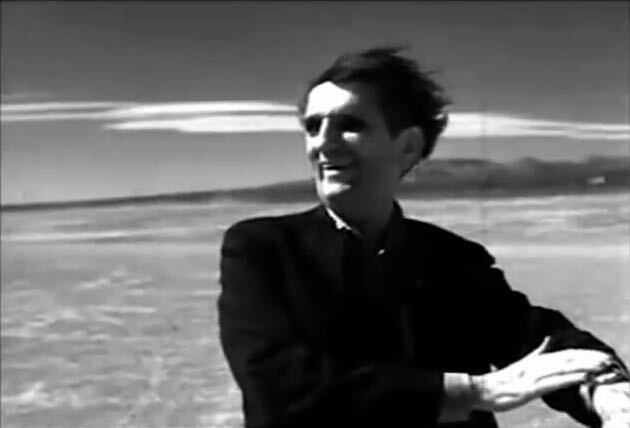 Today’s Harry Dean Stanton video is doubly-sad. That’s because we not only have the recently departed Stanton. 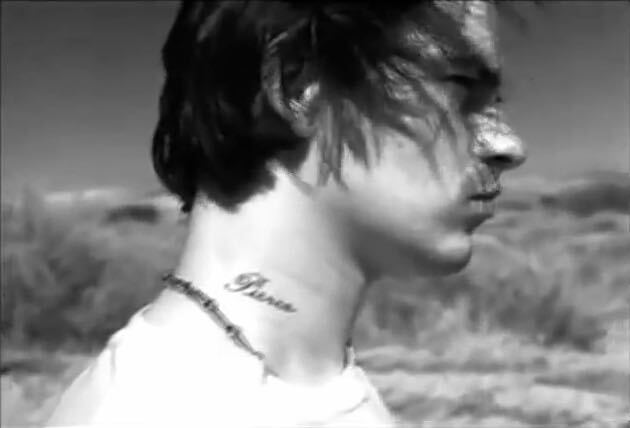 We also have Justin Pierce four years before his suicide. You would know him from Kids (1995). Talia Shire shows up in the video as well. 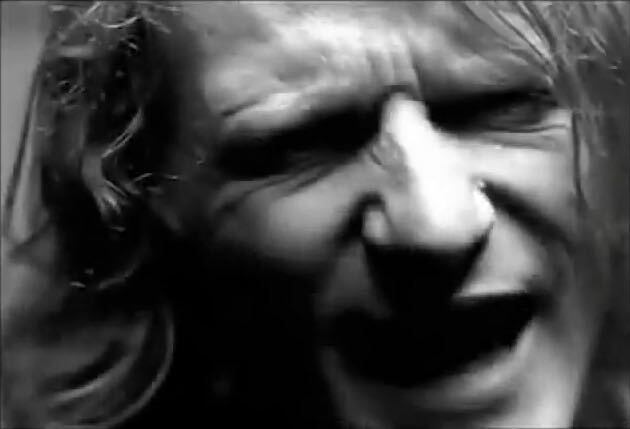 I don’t know anyone else in the video other than lead-singer David Lowry. Thank goodness for Wikipedia. I knew of Cracker because of the song Low. I knew of Camper Van Beethoven because of the song Take The Skinheads Bowling. But I would have never noticed that Lowry fronted both bands even though it’s obvious to me now listening to this song and Take The Skinheads Bowling. that is doing her best Rob Halford. 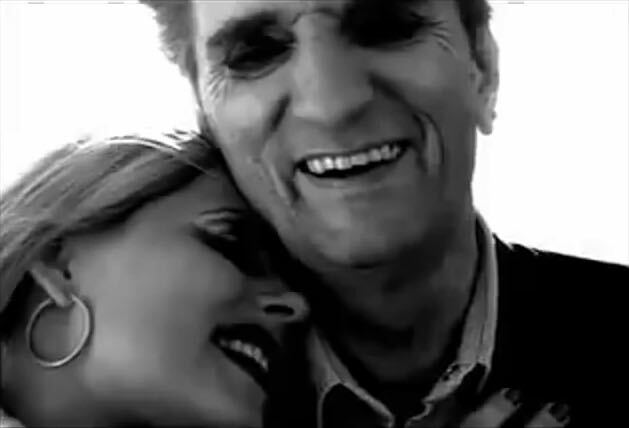 She is prominently featured, but all I could find is that Harry Dean Stanton did two more music videos than I originally thought. It never fails. I’ll do them as well. Smells Like Teen Spirit by Nirvana fame. Did Lowry ask for the Cobain treatment? 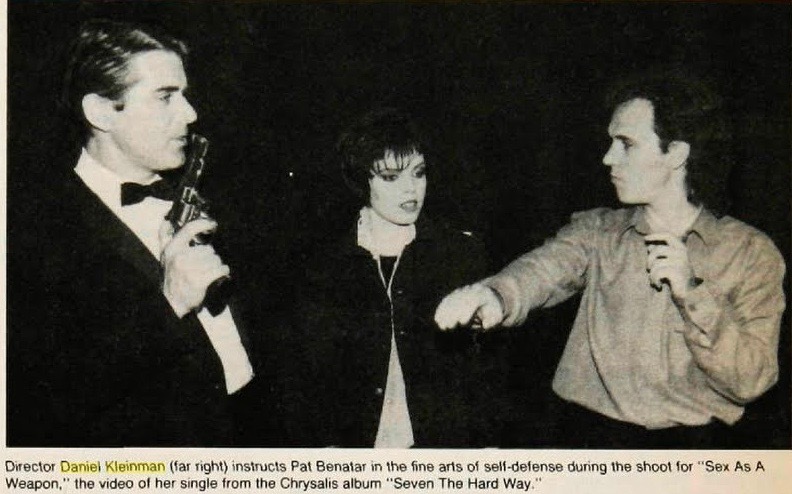 In addition, I know Bayer directed Bullet With Butterfly Wings one year prior to this one. Still, was Goth-Stanton something people were clamoring for? I mean he looks like Lars Ulrich in Until It Sleeps. Yes, that one was also directed by Bayer. And if you are thinking he probably directed some videos for Garbage and Hole based on the woman I couldn’t identify, then you’d be right. The casting director on this one was Crystal Lujan. Her music video credits alone are close to 100. She has done some acting too. I guess she was one of the cult members in that unfortunate Clive Barker movie with Scott Bakula, Lord Of Illusions (1995). Since I started with Rainbow, I might as well do a video by Dio next. but because this music video seems to exist in a universe parallel to Young Turks by Rod Stewart where the kids happen to be metal-heads. 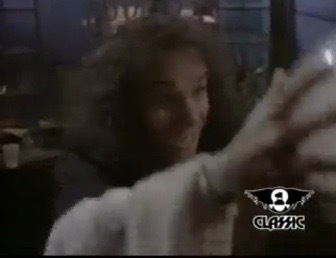 Ronnie Dio was a funny little guy. I made a video called “Rock n’ Roll Children” for him. He had two huge minders with him. Because Ronnie was very short–about five-foot-four–they told us we weren’t allowed to allude to his height. But there’s a type of spotlight in America called a “midget.” It’s a very small spotlight, and it has a different name in England. We were getting ready to do a take and the gaffer shouted, “All right, bring on the midget!” The minders thought we were referring to Dio. They went out of their minds. The video starts with a couple of young lovers who are on the outs that decide to take refuge from the rain in a shop. What they didn’t know is that the shop is Dio’s. I like to think that he waits in there in the dark for runaway metal-heads. The kids spot someone with a cop looking for them so they go hide in Dio’s closet. This transports them inside Dio’s crystal ball. Dio flips his “Open” sign and pulls down the blinds. Two are his max for a trip through the maze of conformation confrontations. Inside, we get a far-shot of the maze. After getting separated, we get the first confrontation. It’s Christmas time, or the time when parents get you things they want you to wear instead of letting you be yourself. Inside is a sweater that is a far cry from the kind of thing she wants to wear. Then we get a nice little touch that Kleinman didn’t have to do, but I’m glad he did. The mirror not only has lets her see the sweater over her, but it changes her appearance in general to the established norm that these kids don’t fit into. Next we cut back to the other kid who has to face the double whammy of a We’re Not Gonna Take It reference by Twisted Sister after he picks up his guitar on the bed and a Girls Just Wanna Have Fun by Cyndi Lauper reference in the form of an abusive looking version of “Captain Lou” Albano. Jeez! 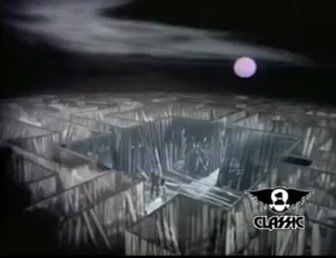 I’ve lost count of the number of 80’s music videos that seem to be inspired by German Expressionism. Now she faces a teacher because if you’ve already referenced We’re Not Gonna Take It, then why not I Wanna Rock. Sorry kid, you’re not the kind of help we want at our store. Metal-heads don’t play basketball. Get out here! Get out of here wannabe T-Bird. I’ll kick you out of my home if you don’t cut that hair! 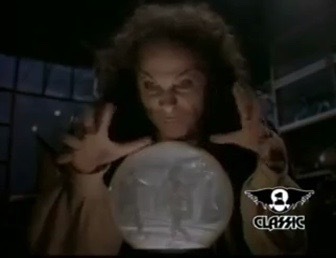 The kids are finally reunited and get ambushed by actors from the previous scenes, so Dio smashes his crystal ball to let them out. They leave Dio’s shop and seem to be reunited to fight for their right to be themselves. I’m a little confused here. Does that mean Dio has a supply of crystal balls in there in case more kids wander in? Does he magically repair the ones he breaks? Did Dio cause the rain in the first place to rescue the kids? Was he invisible in there or was he really just cloaked in darkness? Also, again, why does this feel like the dark metal version of Young Turks? So many questions! The video was produced by Simon Fields who there are some stories about in the book I Want My MTV. In particular, the ones that involve Madonna. I’ll just quote the one from director Daniel Kleinman about him in general. Simon Fields and I used to share a house together. Simon has an edge of the wheeler-dealer about him, but he’s also the most charming man in the world, which is quite a quality for a producer. I had the looks and no charm, and he had the charm and no looks. I thought he had a face like the back of a bus. I mean, how he got Janice Dickinson into bed, I do not know. 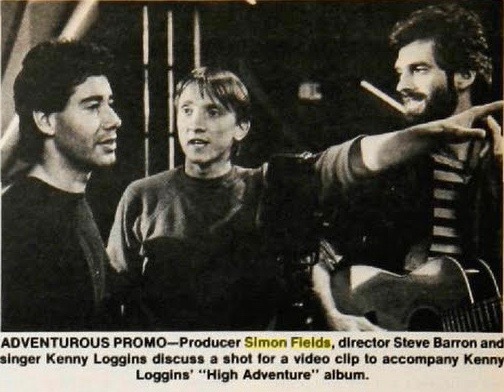 I know these aren’t the best pictures, but here’s a comparison between Daniel Kleinman and Simon Fields as they appeared in Billboard magazine back then. Simon may or may not have slept with Madonna as well. I’ll include those quotes when I do one of her videos where he was involved. 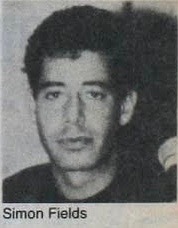 Crystal Lujan was the casting director for the video. She’s worked on at least 100 music videos. She’s also worked in casting in related fields like feature films and television.